Bullet Free Sky, a non profit organization has joined forces with Shooter’s World and the Hillsborough County Sheriff’s Office to help deliver a public message about gun safety and the dangers of Celebratory Gunfire. During a recent press conference held at Shooter’s World Gun Range, at 116 E. Fletcher Avenue, in Tampa, Sandy Duran and her son Diego drew attention to the irresponsible, yet popular practice of firing into the air during the New Year’s Eve celebration, which often results in someone being seriously injured or killed by falling bullets. Sandy became involved in the campaign to inform the public of the dangers of celebratory gunfire two years ago, when her own teenage son, Diego was nearly fatally injured after being struck in the head by a falling bullet on New Years Eve while outside his Ruskin home. By joining forces with Shooter’s World, Bullet Free Sky continue to stress that the organization is by no means anti-gun, but simply a strong advocate of safe handling and shooting of all firearms. “This year, we’ve teamed up with the owners and management of Shooter’s World because they are as committed as we are in promoting the safe and proper use of firearms,” Sandy said. For the first time, Bullet Free Sky will be utilizing a double sided large digital billboard located on Interstate 75 near the Sun City/Ruskin exit. “Motorists both north and southbound will have a clear view of our message,” said family friend and Bullet Free Sky board member Kim Skidmore. 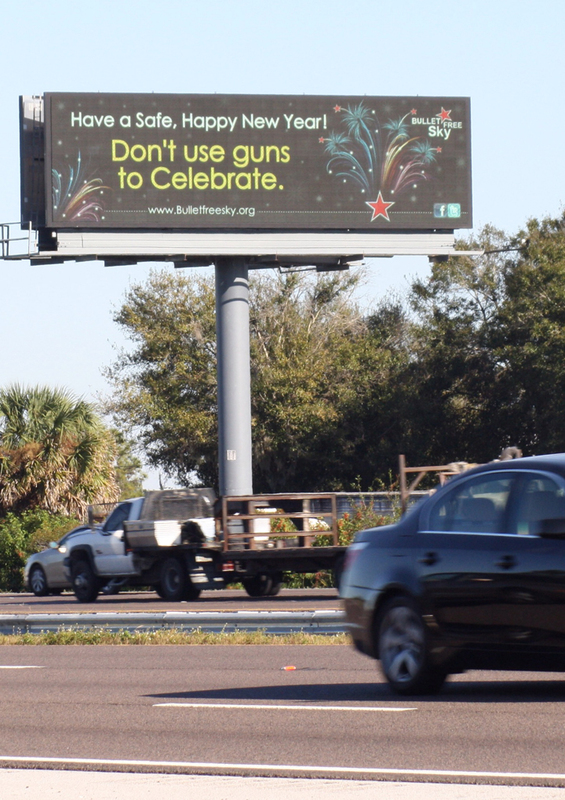 The billboard message reads “Don’t use guns to celebrate. Have a safe and happy New Year” and was posted on December, 17, 2013 and will remain until the first of the new year. “The could not have been possible without the generous donation of $1,200 from Carole Ann Schulz to our non-profit organization,” Skidmore said. Bullet Free Sky wanted to thank in advance everyone for their continued support in helping to get their message out. “If we all work together on this, I am confident we will save lives,” Sandy added. For more information about Bullet Free Sly visit www.bulletfreesky.com.